It’s story time again here at That F’ing Monkey and today I’m talking about Ted. 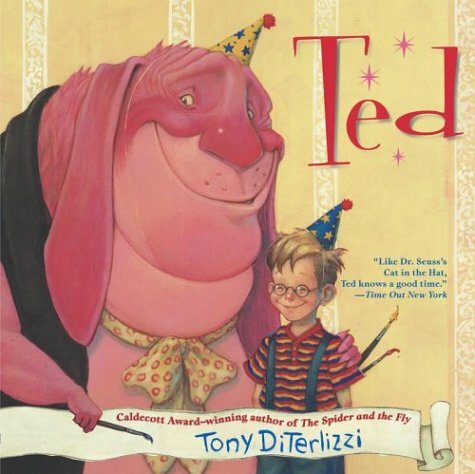 Not the movie about the bear, but a children’s book from Tony DiTerlizzi. Tony’s name is associated a lot with the Spiderwick Chronicles now, but when I first discovered his work it was back in the Dungeons and Dragons Monstrous Manual. His art had this ethereal feel that I was fascinated with. It wasn’t until White Wolf produced Changeling: The Dreaming that I began really following his work. When White Wolf first started publishing the Vampire: the Masquerade roleplaying game they stated that they were going to create five systems; Vampire, Werewolf, Wizards, Ghosts, and Fairies. I remember laughing how silly a fairy book was going to be; when Changeling finally came out (1995) I was blown away. It was a difficult game to run correctly but it remains my favorite White Wolf game ever created. 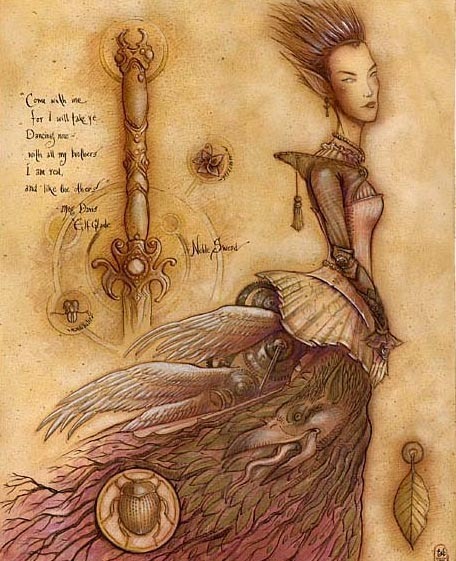 Tony’s art stood out in those Changeling books. His illustrations had an otherworldly grace that helped cement all of the far out concepts the game was throwing at the reader. In 2001 I had finished my time in the Air Force and moved back to Florida. I’m pretty sure I was just checking out a local Barnes and Nobles when I saw that Tony DiTerlizzi was going to be doing a signing at the store. Excited I returned during the signing to see that it was for a children’s story book. I don’t think I had noticed what the signing was for when I first saw the notice, I just knew an artist I greatly admired was there and I wanted to meet him. 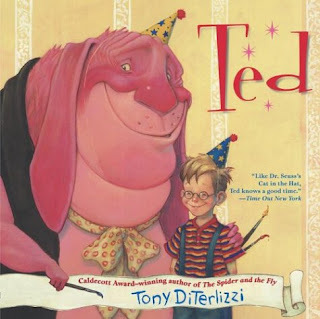 The signing was for Ted, a book about a child and his imaginary friend. I grabbed one of the books to get signed, because that’s what you do at book signings. There weren’t a lot of people there, I’m sure signings now are a much bigger event for him. To stay in theme with Ted I remember the people that were with Tony were all wearing birthday hats. The signing was a party with laughing and just being too loud for a bookstore. 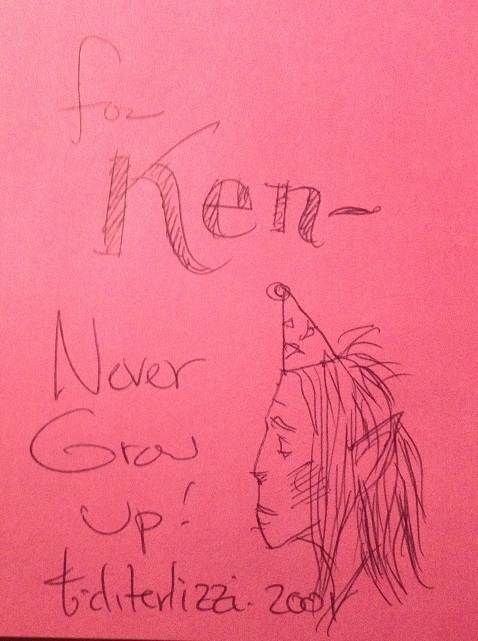 I got my book signed and I gushed to Tony about his Changeling work. He was incredibly nice to the full grown man without a child, standing in the kid’s section, and getting a child’s books signed for himself. I was made to feel totally welcome and after a little while I took my new book home. 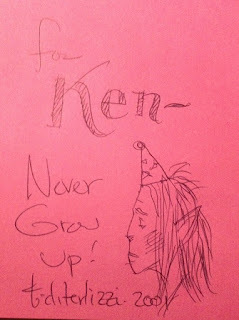 I was thrilled that he had done a tiny sketch for me and the book was proudly put up on my bookshelf. Over the years I hadn’t thought much about Ted. Something this past weekend brought it to mind though. I think I had a daydream about an old Sidhe character that I missed terribly. Because in my mind Changeling is forever linked with Tony's images. I looked at my three year old son and asked him, “How about we read a special book tonight before bed?” He was excited, he didn’t know what the book was only that it was special. So that night we read Ted. I'm happy to say he sat captivated by every page. So today I just wanted to thank Tony DiTerlizzi. For all of the years I was able to enjoy his art and now for all the years to come where I can share his art with my son.